It isn't just jet lag you must overcome on returning from faraway zip codes. Back from 10 days in Paris, I found myself waking in the morning with re-entry blues. I am sure it's about getting up at 6:30 am to read the front section of the NY Times before rushing off to an 8:25 workout with my trainer in my office. No trainer. No office. No clutter. No Fairway. 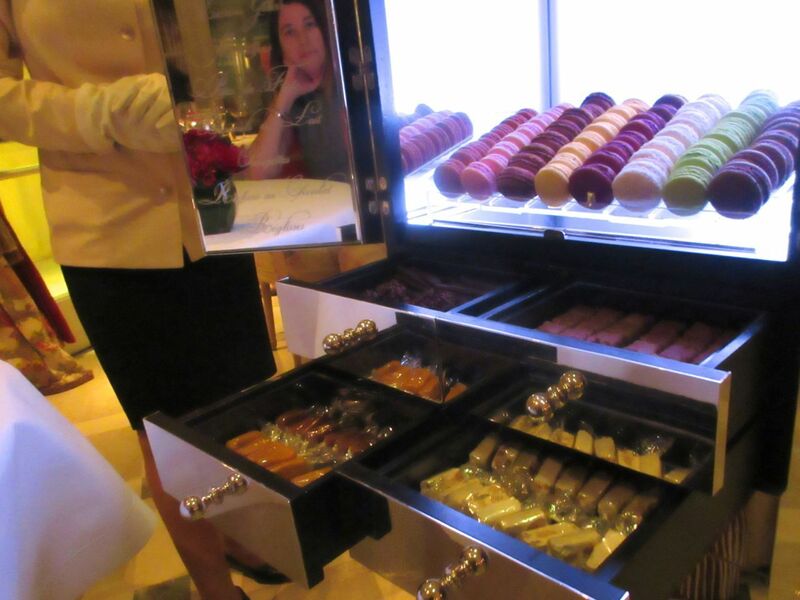 Paris proved to be a delicious escape from reality. The weather was perfect. The Uber drivers wore suits and leaped out of the car to open first one door and then the other, stopping traffic to let you cross, then leaping out again at the destination. A friend joined me. We met each morning in the lobby of our hotel, the wonderfully, ridiculously Victorian little Odeon-Saint-Germain and, on mornings we didn't feel like paying 14€ extra for the hotel breakfast, she was willing to run off to the baker Mulot or Kayser to get pastries or a cheese bread to go with the house's excellent coffee. "What will be our activities for the day?" Lauren would ask. I am sure she has exactly the same conversation at home with her 2� year old, Teddy. We explored The Picasso Museum and the Beaubourg. We went to the Bon Epicerie, studied the still lives of edibles, and laughed at the Brooklyn promotion. Imagine Campbell's Cream of Mushroom soup for sale in this hallowed food hall. More often than not our most important activity was lunch. 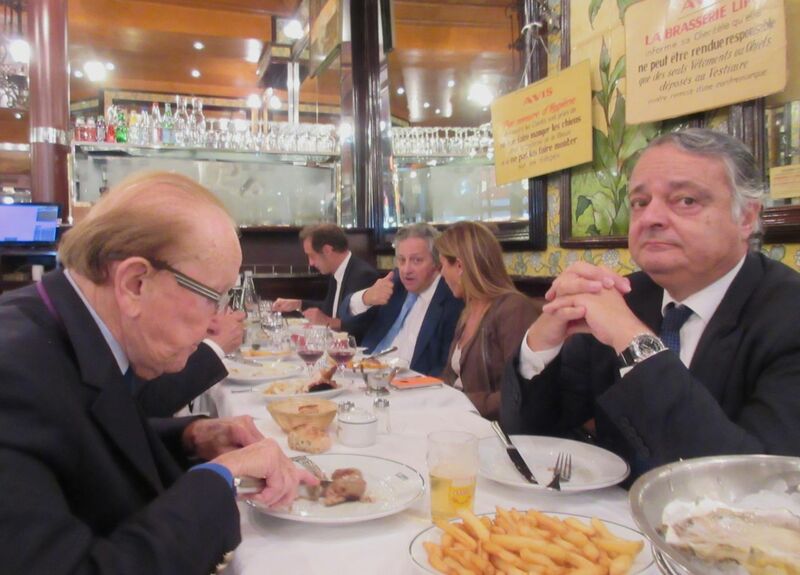 That Boulevard Saint-Germain institution, Brasserie Lipp, would never have been my lunch choice. But I thought it would be reverent to join my friend Vicky Thiel (who invented the mini dress decades ago) and the brilliant, tempestuous publicist diva Yanou Collart. With Yanou booking, we would be seated at a prime table. Indeed, as soon as I saw the classic Gallic duo eating sausages next to us, I was sure we had a grade A station. I shared my oysters with Lauren. 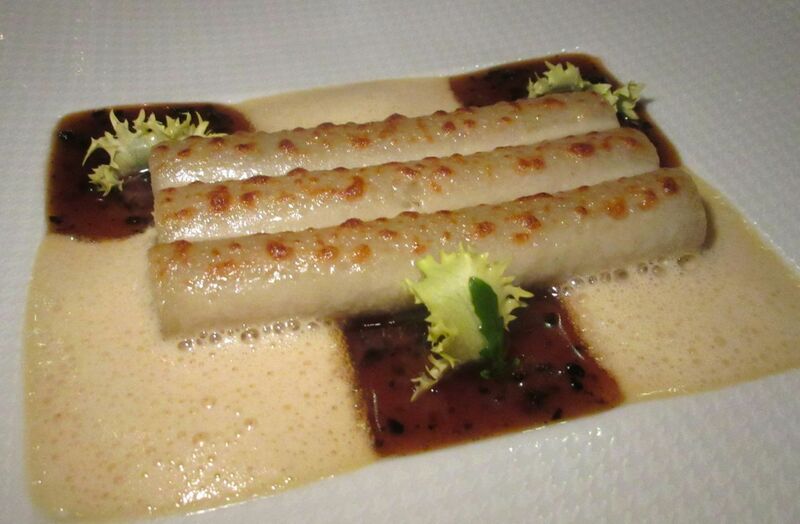 She was pleased that her p�t� en croute came with salade verte in a soup bowl. Celeri remoulade was Vicki's lunch. Yanou barely made a dent in the choucroute. 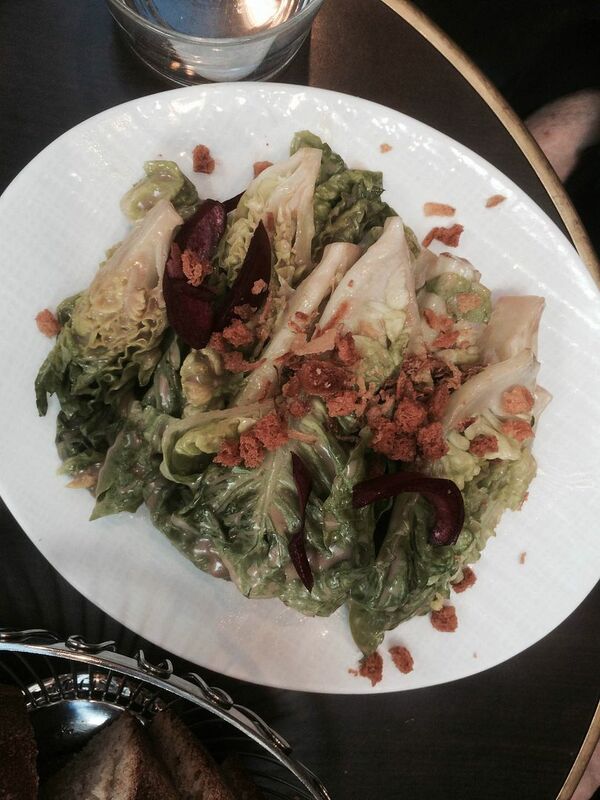 Brasserie Lipp 151 Boulevard Saint-Germain, 6eme. 33 1 45 48 53 91. 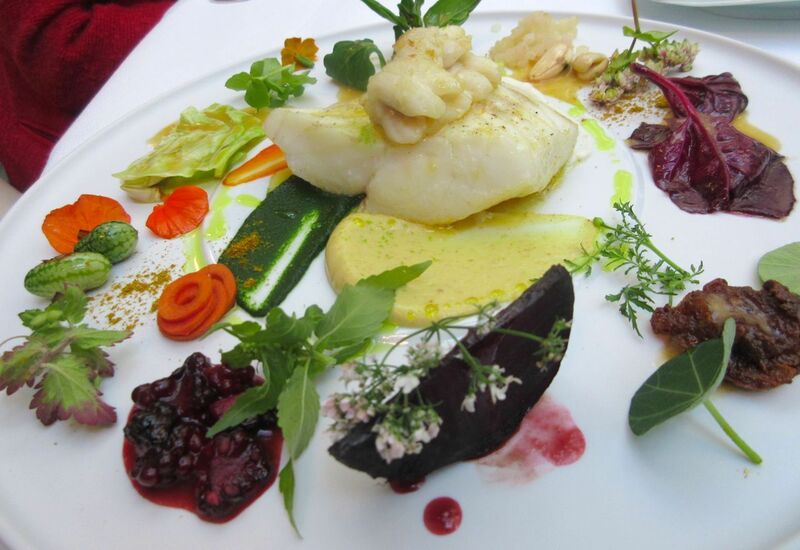 Now, attached to the Camdebordes' Relais Saint-Germain, where hotel guests have priority, there is a weekday prix fixe dinner for 60€ that is notoriously difficult to book. But the family remembers me and my early reviews, so they've been generous about saving a table for me on weekends when the � la carte lunch menu also serves for dinner. Having slept through breakfast on the plane, desperately in need of coffee and hungry too, after checking in at our hotel, my friend Lauren and I join the queue of Le Comptoir hopefuls at 11:35 am. At noon, earlier birds move inside, but we stand ignored, until I stop a waitress on the run and she settles us at an outdoor table with overhead heat lamps that are almost too warm on a grey, cool day. I send her for two coffees as we study the menu. I must have sucrines, my favorite salade green - little gem lettuce - crisp as always under a rubble of croutons, though today a bit over-sauced with a sharp vinaigrette. 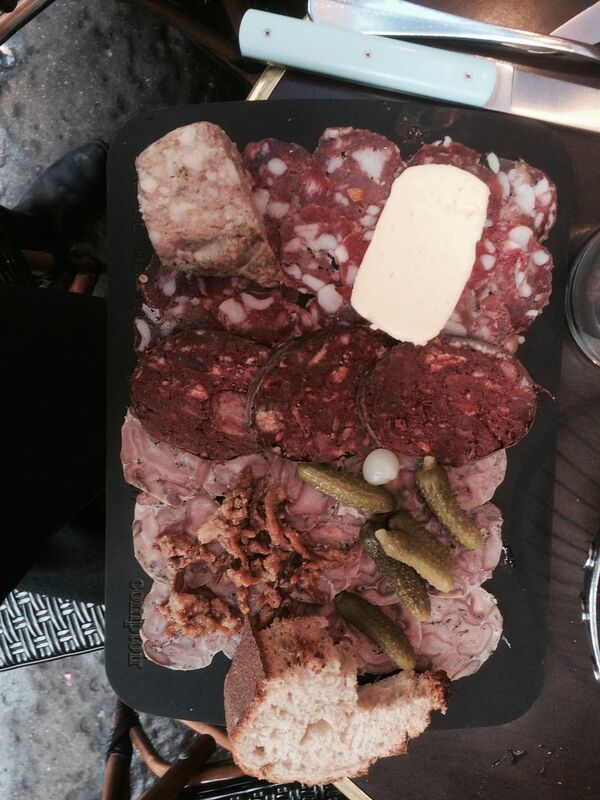 I encourage Lauren to order a platter of cochonaille - "piggy things" for us to share. I taste a forkful of the terrine, an odd, listless lump on the board. And then a round or two of strangely sedate sausage. "Maybe Camdeborde has lost interest," I say, "or figures he doesn't need to be on top of things, given the ravenous hordes." But then our lunch is suddenly elevated with a saucer of gloriously creamy Saint-Marcellin cheese - a large portion for just 7€. Our server brings more of the house's wonderful country bread without our asking. Shall we walk it off? Or take a siesta? A few days later we're on the balcony of Ma Cocotte, a charming little bistro in the flea market near Serpette. It's new to me, put together by Philippe Starck. My friend, interior decorator Penny Drue Baird, has sent us. "It's not about the food really. But it's just so much better than anything that existed." She has said I must order the terrine. 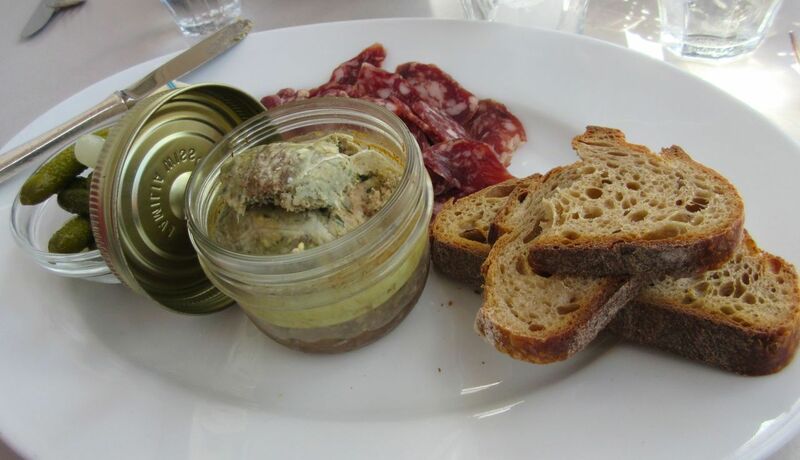 It comes on a platter with ovals of sausage -- a very flavorful mash in a glass jar. The salami has major zing, too. And the bread is too good to ignore. 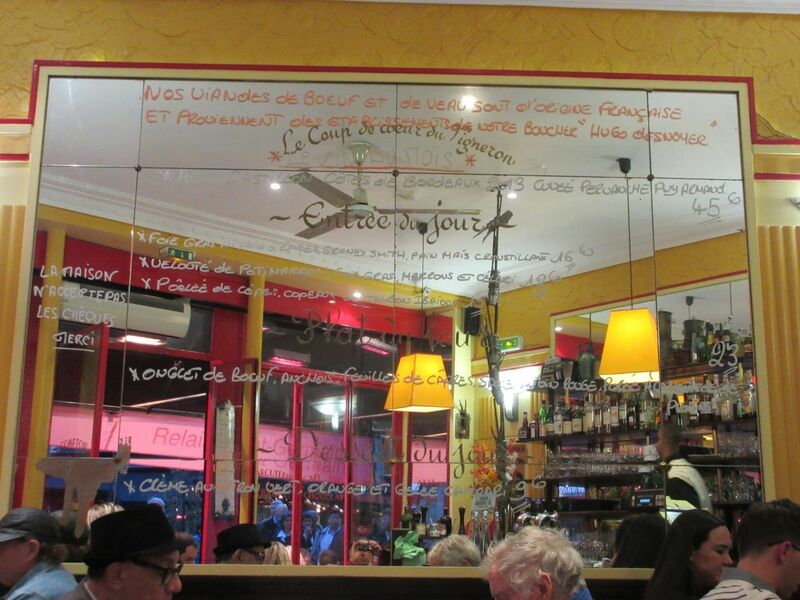 Suddenly, I realize that a cute little caf� at the Flea does better cochonaille than Le Comptoir. That doesn't stop us from returning to claim the Comptoir table I've reserved for Sunday dinner. I look for the welcoming woman who used to run the place. She's gone. Her unsmiling replacement leads us to a two-top next to the bar. No one comes. We stop a server and ask for water. We try to order wine. A basket of the crusty bread shuts us up for a bit. What is obviously a very VIP duo is seated beside us. There is cheek kissing and a quick pour of something fizzy as a gift for them. They are regulars at the hotel, it seems. We take advantage of the server's proximity to order. I am pleased with my boudin noir and its long chili pepper on top, and later, the beef cheek stew is pretty good. 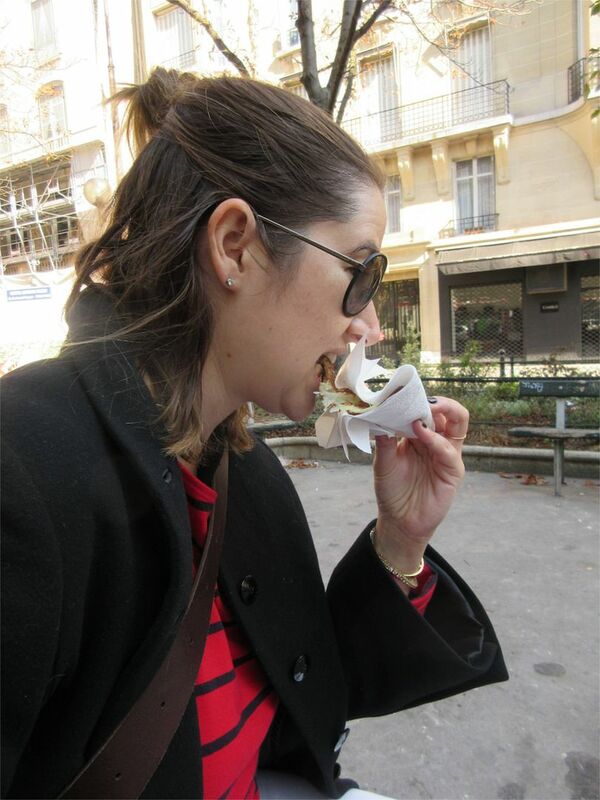 I pass the boudin on to Lauren, who gives me her pumpkin chestnut soup with bits of foie gras from the posted menu. "Was it room temperature when you got it?" I ask her. As the hostess hovers near the VIPs, I stop her. "Is it normal to serve the soup lukewarm?" I ask. She grabs the bowl, slams it down on the bar next to us. Our c�pes arrive and then, after 10 or 12 minutes, hot soup. Wonderful soup. And after that the evening's special steak, an onglet - rubbery and uncuttable with the steak knife. "This is not what I expected when I ordered the steak," says the VIP woman next to us with whom we have exchanged philosophy and business cards. 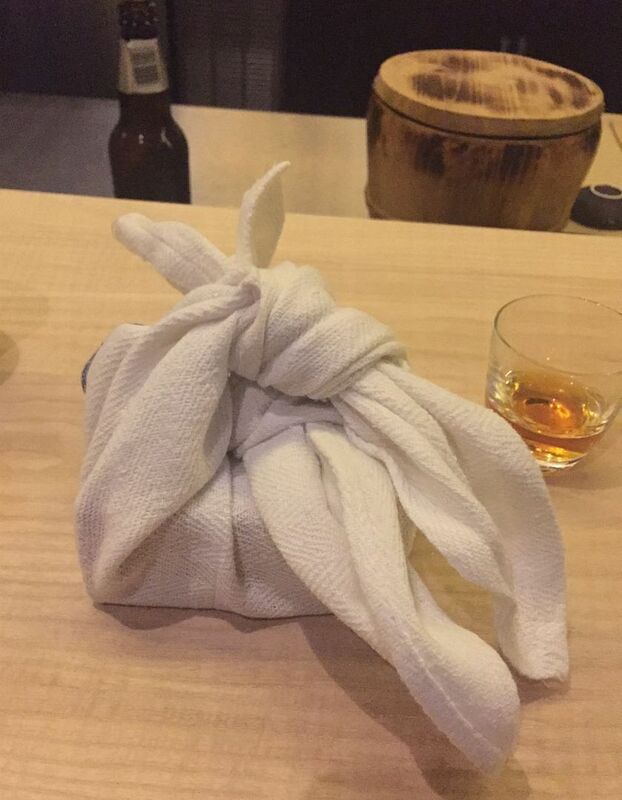 A linen napkin, very small, neatly rolled, is obviously meant for small amuses. We're seated looking out at the garden through mullioned windows framed by flowery curtains in the disarmingly old-fashioned dining room of Epicure in the Bristo l Hotel. Starched linen covers the table. The skirt beneath is fringed. The pale plaid upholstery of the Louis XV style armchairs strikes me as '60s Park Avenue matronly, but thoughtfully built for the long sit. 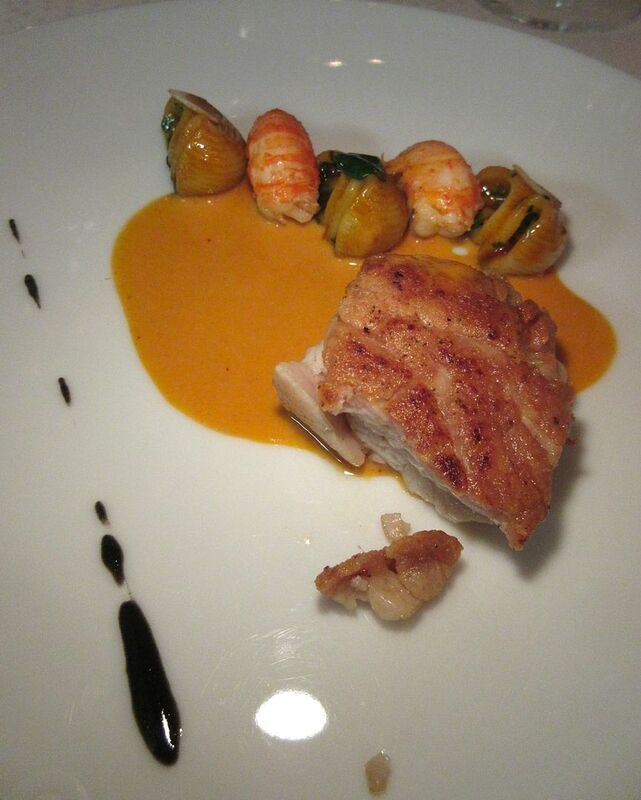 It is scarcely a surprise that Epicure might be dazzlingly good. The trick is always to live up to three-star expectations. Tonight, our dinner had been booked by a friend of the house for Wilfred. Possibly that has dictated the choice of table and the exuberance of the captain. Mostly I like the fuss. Click here to read more and decide if you want to pawn your first-born for dinner here. Epicure. Hotel Bristol 112 Rue Du Faubourg Saint-Honore 8th. 33 1 53 43 43 40. Certainly, I am totally opposed to a fancy tasting lunch on my last day in town. Dinner, perhaps. But here we are, the three of us at Jean-Fran�ois Pi�ge's crankily uncommunicative and impossible to book Le Grand Restaurant. Fancy, stuffy, popinjay perky, precious. There is a 190€ "Debut of Autonne" tasting and a 245€ "Signature" event, too. Ours will be 84€ (the bargain choice). I am sure I will despise it. But fancy (Baccarat sconces and crazy quilt ceiling), perky (integrated young crew in tight navy suits, females coiffed with buns), precious (oversize black gloves dispensing an astonishing layered bread and butter on a curl of sculpted metal) as it is, the bruising euro pinch seems almost reasonable in the flavorsome triumphs of over-the-top amuses and boldface trickery. from the Saturday Bio Market, denizens of Brasserie Lipp, reflection of Le Comptoir du Relais, its sucrine salad, and the cochonaille platter, Ma Cocotte's terrine with spicy sausage, Epicure's stuffed macaroni and the goody armoire, Le Grand Restaurant's turbot wreathed with jewel-like herbs and flowers, and Michele Rostang's classic sweetbreads croustillant may not be used without permission from Gael Greene. Copyright 2015. All rights reserved.